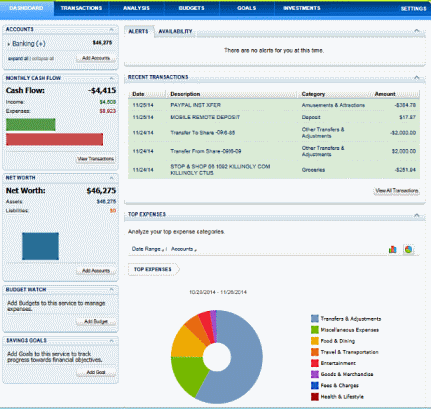 Use this tool to view and manage all of your personal finances from within Web24 online! The Personal Financial Management (PFM) tool allows you to get a complete picture of your finances at any time. Aggregate all of your accounts into this one robust view so you can set budgets and goals, get a clear view of your investments, and transactions at other financial institutions. Dashboard View displays different aspects of your financial state at a glance. Widgets such as the Cash Flow, Net Worth and Recent Transactions help you identify valuable information. Account Aggregation is the ability to retreive balances and transactions from all your financial institutions. Including other banks, credit unions, brokerage accounts, credit cards, store charge cards and more. Transactions provide you the ability to view all transactions from the accounts you chose to aggregate in one central list. Analysis is a visual view of your collective financial state, allowing the evaluation of cash flow over time as well as identification of the largest expense categories. Budgets and Goals give you the means to strengthen fiscal discipline through the ability to track and understand your spending and saving details. Investments shows you a consolidated view of securities across your investment accounts. Get your finances in order today by using the Web24 Financial Management tools, just log into Web24 and click on the Financial Management tab to set it up.